In her new book For A Left Populism (Verso 2018), Chantal Mouffe advocates in favor of an egalitarian, open and embracing, populist political strategy that could serve to unite all the people who have been marginalized by the neoliberal global hegemony during the past forty years. As a discursive and rhetorical device, Mouffe argues, left populism can construct an all-embracing “we, the people” around the unsatisfied demands of all those left behind and opposed to the ruling powers. Mouffe identifies elements of this left populist project in the political discourse of Bernie Sanders and Jean-Luc Mélanchon, and in the approach of the Podemos and Syriza parties. Mouffe repeatedly underscores that her political project is constructivist and anti-essentialist: Mouffe is not trying to instantiate a “real people” and does not favor a hostile or exclusionary notion of “the people.” She views politics through the perspective of agonism rather than antagonism, of adversarial relations rather than friend/enemy relations. (93) Her project is to unite those who have been left behind by means of a more compelling discourse of equality, social justice, and popular sovereignty. Mouffe tries to avoid the near-consensus of criticism of populism by stating up front that her project is about praxis, not theory. Mouffe proposes a political intervention, not a theory of populism, and she emphasizes that she has “no intention to enter the sterile academic debate about the ‘true nature’ of populism.” (9) Nevertheless, those academic debates haunt the project insofar as they pose real risks associated with populist movements. Almost uniformly, scholars and commentators critique populism. Jan-Werner Müller, in his book What Is Populism? (Penn 2016), argues that populism is inherently an anti-pluralist strategy that, when it succeeds (invariably with the collaboration of more traditional conservative elites), veers towards exclusionary practices and mass clientelism. Nadia Urbinati, in her article “Political Theory of Populism” (2019), maintains that populism is parasitic to democracy insofar as it exploits democratic failures by means of an us and them logic, but that when it takes power it inevitably pushes the notion of the people into an extreme or authoritarian direction leading to the distortion of democratic institutions and practices (e.g. the rule of law, separation of powers, checks and balances, etc.) 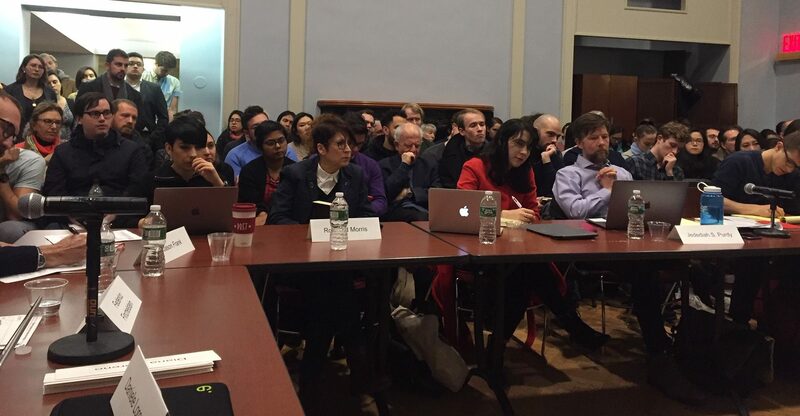 Jean Cohen, in her paper “What’s Wrong with Normative Theories of Left Populism?” presented at the Constellations conference at Columbia University on November 30, 2018, focuses specifically on the dangers of left populism, arguing that it cannot avoid the authoritarian pitfalls of populism more generally. But even with this distinction in mind, the core claim of the academic chorus is that a populist mode of gaining power will inevitably distort democracy in practice. In other words, that there is path dependence: it may not be possible to separate the way a movement takes power from the way it exercises power. There is, certainly, evidence for this. Donald Trump rose to power on a New Right exclusionary populism and has only accentuated the exclusionary nature of his politics in office—to the point where it is now fair to say that he is fueling a fascist, white supremacist, ultranationalist American counterrevolution. There is also evidence for this on the left side of the populist spectrum. The question for us, then, in reading Mouffe’s book, is whether she has crafted a political strategy of an egalitarian and socially just populism in such a way as to disrupt the path dependence? More concretely, is it possible that Bernie Sanders in power could avoid the problems of really-existing populism—such as its authoritarian tendency, mass clientelism, and democratic distortion? Or Jean-Luc Mélanchon? Did this happen in Greece with Syriza? Really-existing political phenomena are notoriously difficult to assess, so perhaps we will need to retreat back to theory—but the central question is whether a left populism strategy can be crafted that would avoid the pitfalls of prior populist experiences. How then do we evaluate Mouffe’s political strategies when the history of populism is so littered with corpses? Perhaps we need to return to the history books and study less spectacular left-populist coalitions like the Front populaire in France (1936-38). Perhaps we should instead project forward and imagine an Ocasio-Cortez or Beto in 2024. Or perhaps we should return to the sharp discontinuity between praxis and theory—which is so central to Chantal Mouffe’s own political intervention. These are the central questions for Praxis 9/13 and they highlights once again the need to directly address the relationship between critique and praxis–between theory and tactics. Jean L. Cohen | What’s Wrong with the Normative Theory (and the Actual Practice) of Left Populism? Federico Finchelstein | Populism of the Left? Jan-Werner Müller | The Rise and Rise of Populism?